I've gathered my best magazine pieces from the past fifteen years, tossed in my most popular works from the early days of online humor, bundled up the comedy material from my national conference talks, and stuffed everything in one juicy volume. "In this sweeping collection, David Lubar turns his crafty eye to everything from home brewing to the Human Genome Project. His analysis—as always—is quirky, clever, and hilarious." That's from Joshua Malina, famous actor (Sports Night, The West Wing, Scandal), writer/producer (Backwash), and comic genius entertaining the masses by way of all manner of social media. 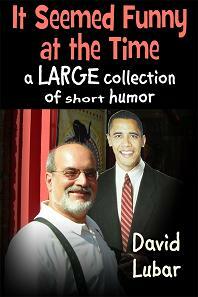 "David Lubar: Funny enough to pay for. And I did, several times!" Thus sayeth John Scalzi, award winning science-fiction author (Old Man's War), humorist, world famous blogger, and highly perceptive former humor editor for America Online. Health care, telemarketers, home brewing, celebrity picture books, Amish buggy rides, pigeon shoots, tasteless sneaker ads, inept Olympic broadcasters, and lots more—it all seemed funny at the time. And, happily, it still does. Check it out. It's a lot of funny for just a little money. Available for the iPad in the iBook store.